Many of you may have already heard about Laravel, but might not just have started to work with it yet. In this tutorial, we shall see what the Laravel framework offers and then learn about how you can build your first web application using it. Laravel – What exactly is it? Laravel happens to be a very popular framework that is meant for developing PHP applications. It comes across as a very clean and good framework for developing web applications. Considering that developing applications should be a wonderful experience, Laravel is fairly simple and allows for expressive syntax. Also, another very good aspect of using Laravel is that it frees you from using spaghetti code. Developers who have used Laravel always state that it brings forward three very important qualities. Simple in nature – several functionalities that Laravel offers is very simple to grasp and understand. If you love simple programming style, you’d surely stick with Laravel. Fairly elegant – Even with very little configuration involved, Laravel’s functions are known to run seamlessly. It also relies on conventions specified in the industry that allows or the prevention of code-bloating. Very well-documented – Laravel always offers updated and complete documentation. The creator even updates the documentation before a new version is released. This makes it pretty easy for people who are just learning the framework. Now that we just about have an idea about Laravel is, we shall go ahead and build a web application. Here, we shall basically build an Instagram-like application, which will allow us to post photos and also like and comment on them. Besides, you can also follow others. FileInfo library – On Windows computers, you will need to add the extension in the PHP.ini file. Mcrypt library – It usually comes with PHP, and is required by Laravel for encryption and generation of hashes. Inside the root folder of Laravel, you shall see that there is a public folder, where file meant to be publicly accessed must be stored. Since there are some predefined folders already, such as images, css, js etc, you can place the Twitter Bootstrap and jQuery files in their likely folders. Before writing code, a certain encryption key is required for Laravel. We shall need this for the encryption of data that may be required, like cookies. Open the file application/config/application.php and locate the key. Here, we change the default value to blank. This will automatically generate a 32 character key for encryption in Laravel. Then, set the index to a blank string. The last requirement is to set up a virtual host for Laravel. This is important foe we do not wish to allow access to the Laravel library and application files. As such, all publicly accessible fiels need to go to the public folder, which is also where our domain should point to. This step informs the machine that the domain name instantpiks.com resolves to the address 127.0.0.1, which is but the local computer. All requests to the application in Laravel are mapped to methods and controllers using Routes. These point out to the application where URLs need to go. Say, to go to http://instantpiks.com/ home, which renders the home file, we can create a route within the routes.php file. This step would route to the file controller, home.php. This routes http://instantpiks.com/contactUS and displays the application/views/home/contactUS.php file. Considering that the page does not have any dynamic processing involved, we can simple render the file for view and not have to spend time setting up a controller for it. The application/controllers folder is home to Controllers in Laravel. The Home Controller accepts requests sent to the root of the Laravel application by default. Like, if you are going to http://instantpiks.com, it will go to the Home--> actionindex() method. Now, in order to create a controller, the first step is to go to applications/controllers and then create a file there. The file name is usually set to something descriptive, which will also be the name of the controller class. Here, we shall create the controller Login, for login purpose. Now, if you happen to open your browser and http://instantpiks.com/login, you shall see the “Testing” message that we had placed in the controller. Also, since we have already set to enable routes to the controller in the routes.php file, this will work without the need for any additional work. Many of the controllers in Laravel tend to extend the Base_Controller. This allows for a way to define functions, which will be the same for all controllers. Here, we will create a method for logging, which will log all controller requests. * Catch any method for those requests that cannot be matched. Now, whenever we wish to log any request, we can just call $this-->logrequst(); from any controller. We shall look to update the Home controller now. For that, we shall require to add a method actionabout, for we created http://instantpiks.com/about route for directing to this method. You can open application/controllers/home.php and update. There are two ways to generate view for an application developed in Laravel. One is the PHP-based Views, which use PHP as the language for templates. Another is the Blade-based Views. These make use of Laravel’s built-in template engine. The Blade Templating Engine makes use of customized tags and methods that permit a better separation of application code and the presentation logic. Also, for simplicity, we shall make use of Blade Templating Engine. All of the view files are required to make use of the .blade.php extension, which tells Laravel to use that particular engine for a view file. Now, we will first create a general purpose layout meant for all the views. Go to application/views/layouts folder and then create main.blade.php file. After this, we shall look to update the index file. Open the file application/views/home/index.blade.php and update. Now, we shall finally look to pass some variable to the views and check them out. The first step would be to create a new file about.blade.php in the folder application/views/home. So, we come back to the Home controller and then update the method actionabout(). If you see the Home controller, you might have noticed that we have set hardcoded values. However, this can actually come from anywhere; say a database or a model. 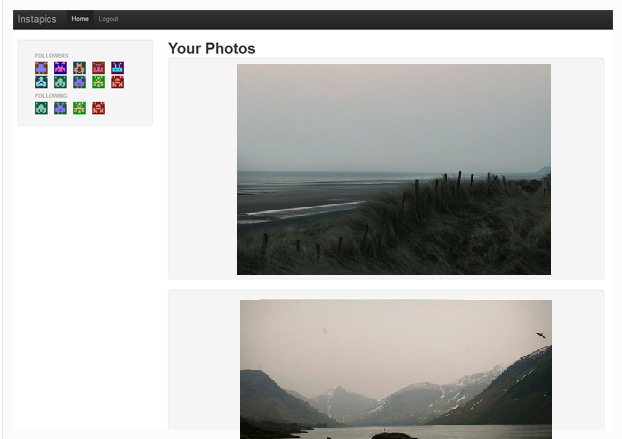 Now let’s check a dashboard with photo views. Following is the controller class. Next is the changed controller class to show the images. Now refresh the page and the following output will be displayed. In this tutorial, we have covered Laravel as it should be done for a beginner to the framework. We started with what Laravel basically is, moved to how you can set it up, and then learnt about its routing systems and controllers. Finally, we ended with the views, using Laravel’s Blade Templating Engine.